Do you have a dominant PON ? Do you have a dominant PON ?? If you have been asked to describe a dominant Pon, you might use the terms, "aggressive and assertive". Unfortunately this is a very common misperception. A dominant Pon tends to be very cool, calm and confident in just about every situation. This is why they are in fact, 'leaders'. Those Pons who fight and bicker among themselves are far too preoccupied with their own petty power struggles and anxieties, to be able to lead anybody anywhere. Over the years the word 'dominant' has taken on a negative image and is quite often used to describe Pons who lack sufficient training, are under socialized (therefore under confident), or extremely fearful, perhaps from being mishandled by owners. Some are aggressive and fearful because of medical conditions (eye and thyroid, allergy,etc. issues) that have gone undiagnosed. 1. Don't allow your dog to eat its meal until you (the top dog) have eaten first. 2. Don't allow your dog to leave the house (den) before you (top dog) have passed through the doorway first. 3. Don't allow your dog to climb onto the sofa or bed. 4. Don't allow your dog to climb your stairs, or to stare at you from the top of the staircase. 5. Don't allow your dog to look into your eyes. Individual breed behavior needs to be considered when deciding if a particular dog is dominant or merely has breed characteristics. 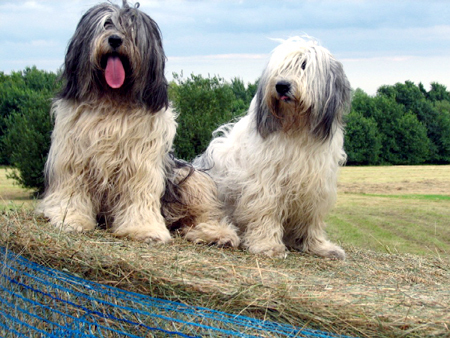 Sheepdogs follow a herding behavior pattern when dealing with both humans and animals. This behavior pattern always needs to be taken into account, regardless of circumstances. Further, I consider myself among those who believe that dogs are sentient beings, capable of making decisions, reviewing situations and learning for themselves. So bearing all this in mind, if you happen to hear someone repeating rigid rules on popular canine television shows, or read about them in doggy magazines, their opinions may be far from being entirely valid. Unfortunately many television networks and popular publications, do not check out the qualifications of their contributors and many of these "behaviorists" are in fact self proclaimed experts, nurses, and dog lovers who are merely regurgitating what they have read in popular dog psychology books, most of which have been written by people who are themselves passing along theories they have not scientifically documented. Owners need to carefully check the references of those who offer advice and try and determine credibility of theories they present. Being a good owner means thinking for one's self in all situations and taking nothing for granted. Most Pons need a "job" and when allowed to participate in agility, conformation, therapy and other activities, turn their attention to these tasks and are more relaxed at home with their human families. These Pons have discovered how to be happy with their humans as well as being happy with their given tasks. Was this happiness achieved by humans asserting "pack leadership" or "alpha status" over the Pon's behavior ? Of course not ! The family Pon has had his life changed by offering him his genetically engineered job. In summary, consider your Pon's genetic potential when trying to determine if your Pon is dominant or in fact, trying to fulfill his genetic role in life. A contented, well adjusted Pon is a busy Pon.